Glaucoma Center of Michigan now has three convenient offices. Our flagship Southfield office is located in the Comerica Building near the northwest corner of Telegraph Road and West Twelve Mile Road, just north of the Northwestern Highway/I-696 interchange. It is accessible from either Twelve Mile or Telegraph Road. Ample free parking is available. The North entrance provides the most handicap parking and ease of entrance into the building. Inside, elevators take you to our third floor suite. After exiting the elevator, turn right and proceed directly into our office. 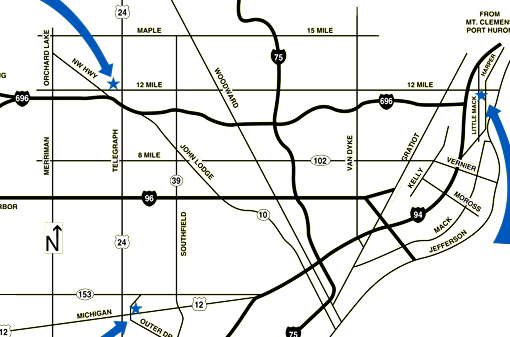 Our office to serve Eastside patients is located on the south side of Twelve Mile, just east of Little Mack and approximately ¼ mile east of I-94 in the Ascension St. John complex. After entering through the West entrance doors, GCM is the first office on the right. Ample free parking is also available. Our Dearborn location serves the Western Wayne and Downriver areas. It is in the 3rd large building (called Eastpointe) on Garrison which leads off of Outer Dr. It is just north of Michigan Ave. and approximately ½ mile east of Telegraph. Handicap parking is directly across from the building entrance. There is ample free parking in front (east) of the building and in the multi-level parking structure west of the building. Enter the building and our office is conveniently located just to the right in Suite 102.